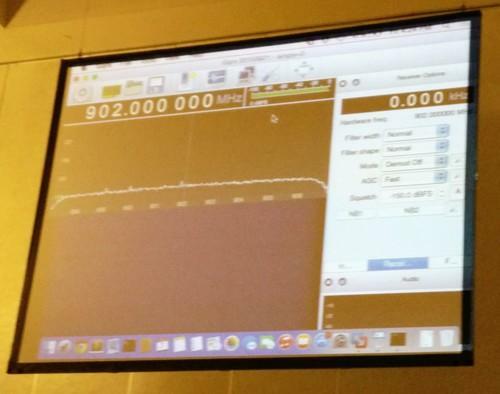 A talk about a radio-based privacy device dubbed ProxyHam that promised to allow hackers to connect to Wi-Fi networks from as far as 2.5 miles away was abruptly pulled from the DEF CON schedule by its creator a few weeks ago. The incident, which some speculated was the result of pressure from the FBI or the NSA, outraged the security community. But as hackers are not the type to give up easily, they quickly came up with a replacement that in many respects is better than the original. Called HamSammich, the new device is the creation of security researchers Robert Graham and David Maynor and can proxy data over the 900 Mhz radio band from 20 miles away at up to 56kbps -- the top speed of a dial-up modem from the late 1990s. It was presented at the DEF CON hacking conference on Friday. The idea behind ProxyHam and HamSammich is that a user can install the device in a public place, connect it to a free Wi-Fi hotspot and then relay the connection over the 900 Mhz band to a computer that's equipped with a powerful antenna pointed at the location of the first device. This would make the user appear to be physically in one location while in fact he would be miles away. The problem with the ProxyHam concept is that its creator, a researcher named Ben Caudill, believed that no one monitors the 900 Mhz band, but in fact it's quite easy to see the signal and track it, Graham and Maynor said. The two researchers believe that the more likely explanation for the talk's sudden cancellation was that Caudill's activity was discovered by the Federal Communications Commission because he boosted the transmit power to levels that are not allowed. He was also using encrypted signals over the 900 Mhz amateur (ham) radio band, which is also against regulations. The FCC has people watching the radio frequencies in all cities, so the agency probably tracked him down and made him sign a consent decree that prevents him from engaging in this type of activity in the future, Graham said. HamSammich takes a different approach. It uses a very weak signal, but spreads it out using many software-defined radios. The signal is kept behind the noise floor, which puts in the range of radio interference caused by natural phenomenon like thunderstorms and man-made devices -- the background noise one hears when tuning a radio. This severely limits the device's connection speed, but increases its range. And while the signal can still be tracked with specialized equipment, there's a good chance that no one is looking. Nobody will complain if your added noise is below the background noise, Graham said. The transmitted data is not encrypted, but that's not of great concern if no one knows it's there, he said. Caudill's company, Rhino Security Labs, which announced the talk's cancellation in July, did not immediately respond to a request for comment. However, Caudill told Wired in an interview last month that the FCC had nothing to do with it. At the time, Rhino Security also said that it was immediately halting development of ProxyHam, that it wouldn't release any more details about the device and that existing units would be "disposed of."